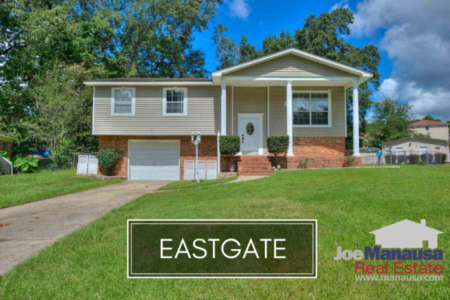 Located in Northeast Tallahassee, Eastgate serves up an excellent sampling of median priced homes with the added benefit of being located in a highly desired part of town. Eastgate is convenient to shopping and with quick access to both the Interstate and Capital Circle NE, you can be just about anywhere around Tallahassee in less than 15 minutes from your home. 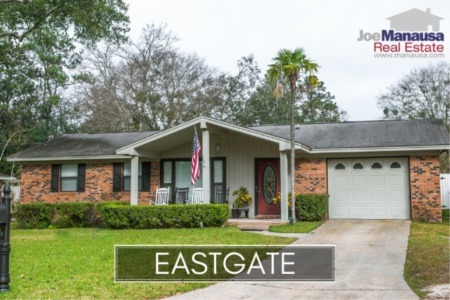 It's hard to find a home for under $200,000 in Tallahassee's popular Northeast quadrant, but Eastgate stands ready to fill the order. In this report, we will look at home prices, home values, and sizes of homes in Eastgate, as well as show current listings in the Tallahassee MLS and all closed home sales going back to 1991. Home prices rebounded strongly in 2014, with the average closed home sale recorded at $142,400. The one sale so far in 2015 was priced at $159,900, but it's far too early to be claiming any kind of trend after just one sale. Last year's pace of home sales was the best Eastgate has seen since 2001, but this year has started off slowly. With only one home sold and just three more on the market, 2015 looks to be a slower year for Eastgate. Average home values in Eastgate rose 15% in 2014, bringing averages back to levels last seen in 2008. The one sale of 2015 was recorded at $140 per square foot, which is higher than the average recorded at the peak of the market in 2006. The average home size sold in Eastgate typically falls in a range of 1,200 to 1,500 square feet, but this year's one sale would represent the lowest on record at 1,143 square feet. I suspect we'll see the average size of homes move back up into the normal range once a few more sales are recorded. I hope you enjoyed our May 2015 update on home sales in Eastgate, please feel free to drop me a note if you have questions not covered in this report.